Precious metals are now not very popular among traders and investors. Like Gold rate, Silver rate gradually falls lower and lower. 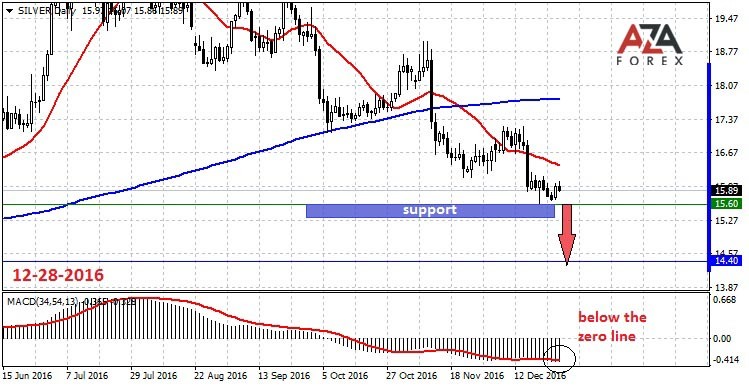 On the chart the precious metal clearly visible downward trend, the price of Silver reaches the support level, then trampled by him, passes through and goes back to lateral movement. And now, there is sideways movement after the last failure. Considering that before the new year, many of the participants of the world markets, major investors, hedge funds, and traders prefer to close all open long positions, the more popular it becomes the American dollar is the currency of mutual settlements. Thus, the demand for the precious metal, is not likely to increase, at least this year. Therefore, it is safe to open a short position, while passing the support level of 15.60, with the goal of 120 points profit. The price is below a simple moving average 20 MA indicating bearish trend.